Ubud is a star article! It is a high-quality article complete with maps, photos, and great information. 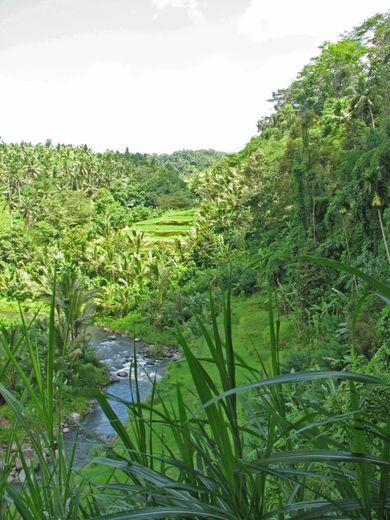 Ubud is pronounced 'oobood' as in the same way as the 'oo' sounds in 'good'. Even if you mispronounce the name, the locals aren't likely to do anything more than titter. As they say, seng ken-ken!- Balinese for 'no worries!'. While Ubud seems to outsiders like one small town, it is in fact fourteen villages, each run by its own banjar (village committee). Ubud has grown rapidly, and some central parts are creaking under the strain of coping with the number of visitors. That said, most development is sympathetic to the zeitgeist, if not designed specifically in the local style. Growth continues apace, but there are still terraced rice fields along the rivers, and away from the town centre, regular, quiet village life carries on relatively undisturbed. Central Ubud is heavily commercialized and teems with tourists. Ubud has a known history back to the eighth century, when the Javanese Hindu priest Rsi Marhandya came to Bali from Java, and meditated at the confluence of the two Wos rivers at Campuan, just west of the modern day town centre. 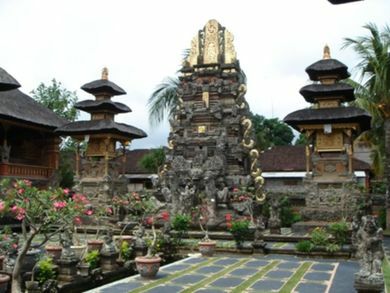 A shrine was established and later expanded by Nirartha, the Javanese priest who is regarded as the founder of Bali's religious practices and rituals as we know them today. At this time the area was a centre of natural medicine and healing, and that is how the name Ubud originated: Ubad is ancient Balinese for medicine. Orienting yourself in Ubud is fairly straightforward. The town sprawls for several kilometres in all directions, with all of the small villages within a five km radius of the central market being loosely referred to as "Ubud". If you choose a reasonably central place to stay, it is easy enough to get around on foot. Central Ubud has three main streets: Jl Raya Ubud, Jl Monkey Forest and Jl Hanoman. At the intersection of Jl Raya and Jl Monkey Forest are Ubud Market, Ubud Palace, and the main bemo stop — unsurprisingly, there's also a near-permanent traffic jam here. Jl Monkey Forest, which runs south through town to the Monkey Forest, is a built-up area, and home to a wide array of accommodation, art galleries, and cafes, as well a number of local services such as schools, a sports field, pharmacies, and travel agents. Jl Hanoman, which runs parallel to Jl Monkey Forest just to the east, is a bit quieter and makes for more pleasant walking, but still extremely touristy. To the immediate west and northwest are the villages of Campuan (Tjampuhan, Campuhan) and Kedewatan, home to some of the most upmarket hotels in the whole of Asia, with views over valleys sculpted by the Ayung and Wos rivers. Directly to the south, past the Monkey Forest and still within a twenty minute walk of the central market, is Padang Tegal which then runs into the southern villages of Nyuh Kuning and Pengosekan, about three km from central Ubud. 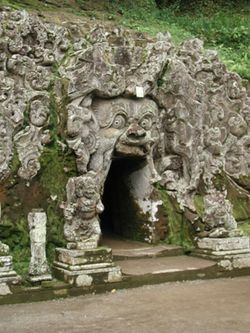 Directly to the east is the village of Peliatan, and then Teges and Bedulu, home of the ninth century Goa Gajah (Elephant Cave). Due to its elevation at 200m above sea level, Ubud enjoys cooler temperatures than the coast, and it is sometimes necessary to bring a pullover for the evening. The midday sun can still be scorching though and the humidity often relentless, a murderous combination for temple tramping which, in hilly Ubud, usually requires climbing up and down staircases. (Head out early to beat the heat and the crowds.) If there is a time to avoid, it would be the depths of the wet season in January and February — when it rains in Ubud, it really rains. There are regular public bemos from Denpasar's Batubulan terminal to Ubud which cost Rp 8,000 (but ongoing foreigners rate is Rp 50,000), and take about an hour. Most bemos run in the early morning, and you will not find any after 16:00. In the opposite direction, bemos depart every morning from the central market (northern entrance) in Ubud. Foreigners are likely to be asked much more (bargain!) or even to charter the whole vehicle - there's really no need, as they will pick up passengers on the way. To get to Batubulan from South Bali, one previously had to have 1-2 bemo connections in Denpasar. Now, with Trans Sarbagita (see the main Bali article for details) government bus service, this way can be far more comfortable (air-conditioned bus) and even cheaper (Rp 3,500) for those going from/to Nusa Dua, Kuta, Sanur, Airport or all the places between. If you want to take a taxi to Ubud from South Bali, it is best to charter the vehicle for a return trip, otherwise, you'll be hit with a 30% fee for going out-of-town. Metered fares, one-way and not including surcharge, are around Rp 150,000 from Denpasar and Rp 200,000 from Kuta. Uber is available in southern Bali, but supply is low and prices tend to be high. More common are the local homegrown alternatives -- Grab (based in Singapore) and GoJek (from Indonesia); both apps are readily available in the App Store or Play Store. From Legian to Ubud will just cost you Rp 135,000. It's a fixed price. Just set the pickup and the destination, the price will be shown in the app and you pay the driver with cash when you arrived or credit card option is available too. There also the Indonesian GoJek which is very similar to Grab. However, being about five times less than ongoing rate, local taxi cartel strongly opposes these services and drivers may refuse tourist taking to/from Ubud in order to avoid confrontation. This all being said, there's a local online / smartphone service called Bali Cab which is accepted and you will be able to book drivers from the Ubud area. The prices are similar to Blue Bird metered taxis (which are also barred from picking up passengers in Ubud), so while it's well above Uber, etc, it's still reasonable without the need to haggle. Download the app here: PickMeApp iOS and PickMeApp Android. Currently, there's no public bus service to Ubud (there are bemos however, see above), but tourist bus services are abundant. Perama offers daily direct transfers to Ubud from Ngurah Rai International Airport, Sanur, Lovina, Kuta, Bedugul, Candidasa, and Padang Bai. These are convenient and inexpensive; eg four times per day from the airport for Rp 50,000. Rather less conveniently, the Perama terminal is not located in the centre of Ubud, but about 2km south in Padang Tegal, on Jl Hanoman just south of the intersection with Jl Monkey Forest. You can go to the "official Tourist Information" (just in the middle of town, on the big crossroad. opposite the market at Monkey Forest Road/Jalan Raya Road) and buy your ticket there (official outlet, same price) and Perama will pick you up there, to transfer to the Perama Bus Hub out of town. Or you can also book online and agree on a motorbike pickup for Rp 15,000 from pretty much anywhere in Ubud. While just a few years ago, Perama buses were well-maintained, air-conditioned, nice and generally worth their price, currently (probably owing to it's excess popularity among tourists) it may not be true, and you may end up in an old, hot, local-style bus, not more comfortable than a regular bemo but for the double or triple price - the only advantage being a non-stop service. As such, booking the ticket in advance and paying without checking in person what kind of bus they will provide may be unwise. 2017 note: having taken several trips, it seems now even the oldest vans / buses have aircon, however half of the times the driver just rolls his window down and doesn't turn AC on, presumably to save fuel. Shuttle Bus is actually Van/MPV's (6 to 10 seaters) run by private travel & tours agencies. You can either hire a Shuttle Bus service via your hotel/homestay (price will be slightly higher by 10-15%) or go direct to either Gedong Sari or Perama. If you travel by two/as a couple, you will be sharing with other passengers. If you are travel with a group of minimum 4, 6, 8 person, you are encourage to hire a private Van/MPV's or rent a car (Van/MPV) service which cost more less than hire a Shuttle Bus service. Be careful taking afternoon shuttle to the airport, as the traffic is so jammed up it may take up to two hours to picking up all passengers in Ubud plus another two to three hours going to the airport via Kuta to drop off some passengers. Below are the latest update (as at July 2013)for Shuttle Bus Fares/Schedule from Ubud. If you have a reservation at a homestay and the owner has a vehicle, they will offer to pick you up at the airport for ~Rp 250,000. Check when you make your reservation. They will wait for you outside the arrival hall with your name on a sign. A convenient option especially if you arrive at night as they take you directly to the homestay. Driving in Bali is a cheap, fun and relatively safe experience. Despite the apparent madness, motorists are generally tolerant and will give way. Keep your eyes peeled for the green road signs sparsely located along the road. Bear in mind that Ubud is in the Gianyar regency, so do not panic even when road signs indicate Gianyar only, as labels tend to be inconsistent. When in doubt, keep going straight. If seriously in doubt, hop off and ask the locals. "Ubud?" If you speak no Bahasa, or "Permissi, bagaimana ke Ubud? (Excuse me, how to go to Ubud?) and they will be glad to gesture you in the right direction. Budget 50% more time than what Google Map quotes for getting lost and asking for directions. Traffic volumes are depressingly high in central Ubud - the narrow roads and one-way systems mean that today central Ubud is as noisy and polluted as its southern tourist neighbours. Further the sidewalks are often blocked by motorbikes, or a collapsed section necessitates a step off the sidewalk potentially placing you in the path of traffic. That traffic could be a tricycle or a truck, so keep your wits about you. Central Ubud is congested with traffic and people, especially in the afternoons when buses bring in tourists from outside Ubud. Be prepared for the crowds and the heat. Very few stores and restaurants (even the higher priced ones) have A/C so there are few places to get quick relief. This can come as a shock to visitors expecting a quiet and tranquil cultural hub. Blame Elizabeth Gilbert. Those of you who managed to make it through the turgid best-selling novel Eat, Pray, Love, might have an inkling of what is coming up. Ubud features quite heavily in our heroine's search for fulfilment, and the knock-on effect in the town has been huge. Acolytes have swarmed to Ubud looking for (and sometimes finding) places and people referenced in the book. The economic benefits of the novel to the area ratcheted up a whole other notch in mid-2009, when the eponymously named movie was shot in and around Ubud, Julia Roberts and all. 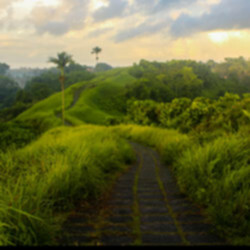 Just be aware though that Ubud cannot necessarily guarantee a remedy for every mid-life crisis. Bemos ply the main routes in and around Ubud, and the main stop and gathering point is Ubud market at the junction of Jl Monkey Forest and Jl Raya Ubud. Most bemos stop running in the late afternoon, and are always more frequent in the morning. Men offering Taxi services plentifully line the main streets of Ubud - rates are always negotiable. Scooter Taxis are generally half the price of car Taxis. BlueBird Taxis do not operate in Ubud (meaning they have to dispatch from Denpasar). Whilst this means that incomes are higher for taxi drivers (or at least the owners of the vehicles) this also means if you are staying away from central Ubud, or want to visit sights away from the centre, you will need to hire a driver for the day. Prices are about x2 to x3 the BlueBird equivalent (so IDR70,000 for a short trip, IDR150,000 for a 10km drive to a temple, IDR400,000+ for a half day trip). If you do take a one-way journey to a temple outside Ubud you may struggle to find a car for the return journey. Uber/Grab is growing in Bali but unfortunately not in Ubud. The local tourist industry strongly oppose these services that too reasonably priced (expect three to five times less than through your hotel and those you find on the streets). For people holding taxi sign, expect to negotiate a price, although many will decline anything less than a third less. Most local transport comes in the form of SUVs or minivans that can be hired with a driver for specific trips. Look for the circular yellow "E" logo on the windshield certifying them as Ubud Transport Association members. Drivers wait along the busy streets holding "TAXI" signs, calling out and offering their taxis as you walk by. You can (and should) haggle over the price, and pay less than for the equivalent journey in a metered taxi. A short trip should be less than Rp 20,000, and drivers will be glad to wait for you for a return fare. If you do not need a ride, a polite no or ignoring their solicitation is sufficient. Generally they are not persistent unless you respond. Also, there are guys on motorbikes who will also offer bike rides (ojek) and are about half the price of those in a car. Many hotels are located out of town, and are happy to offer regular, complimentary drop-off and pick-up services to central Ubud. Expect to pay higher than taxi prices if you are intending to go further afield. 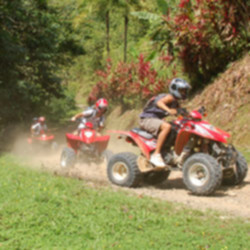 As elsewhere in Bali, motorbike rental is widely available, and you will not be short of options. Expect to pay between Rp 40,000 and 80,000 per day for a late model motorbike in good condition. Look for rental agencies on all the main streets, or ask your hotel to organise for you. Navigation can be confusing, as signage is limited and all the roads look pretty much the same at first, but take it easy and stop to ask for directions if (when) you get lost. You can book rent scooter before your arrival at Bali on plenty of websites such as (Dewa Motor Rental free online booking), Motormaticbali or gotravela with competitive prices and communicative staff with online assistance. You can rent bicycles for about Rp 20,000-30,000 per day. There is a large selection available at the corner of the football field on Jl Monkey Forest. Beware though: Ubud is very hilly, so cycling can be hard, sweaty work. Traffic on the main roads is heavy and drivers rarely pay heed to cyclists. As of December 2018 bicycle supply has dried up. But Pernama Bali Rental located in Bar Cawang immediately south of Perama Bus will rent like new mountain bikes for 40.000 Rp per day. The key historical sites are located out of town, some as far as 20km away, and you might find it worthwhile joining a tour to visit these. If you do visit attractions such as Goa Gajah, Gunung Kawi, Pura Kehen and Tirta Empul under your own steam, try to find a knowledgeable guide when you get there. Whilst you will certainly appreciate the beauty of these places, their cultural and spiritual significance may be lost without a guide. Northeast of Ubud town centre the land starts to become more undulating, and this is a good place to view Bali's classic rice terraces. The village of Tegallalang is very much a tourist trap, but it is worth braving the hordes of trinket peddlers to view the stunning terraces there. From the town centre, take Jl Raya as far east as you can go, and then turn north and continue about 9km until you reach Tegallalang. Look for the picture postcard rice terraces on you right-hand side. For those moving on north to the Kintamani area, this is on route and makes for an easy stop. A small fee is charged to cars entering, at least to tourists in hired cars. 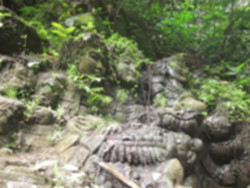 On the opposite side of town in the Campuhaun, Sanggingan, and Kedewatan areas, the landscape changes dramatically as great gorges have been carved out of the limestone land base by the Ayung and Wos rivers. It's no surprise that so many five star hotels have made their home in these lush, dramatic valleys. Opportunities for viewing these gorges are many. You can just find your own way and explore by motorbike (it is very hard work by bicycle as the hills are steep). Head west out of town over the Campuhan Bridge and just start exploring. The main road here is Jl Raya Sanggingan, and if you continue heading away from town you will reach the junction with Jl Raya Kedewatan. From that point you can turn in either direction and just keep exploring. Alternatively, you can stop into a hotel or restaurant, have a drink or lunch, and gaze out in very civilised surroundings. If your pockets are deep, the restaurant at the Four Seasons in Sayan probably has the best views of all of the Ayung Gorge. A more budget conscious option is the lovely Indus restaurant in Sanginngan, with tables facing out to the Wos River. As a centre of the arts, Ubud has over 65 different gamelan, dance and shadow puppet performances every week, in various venues, or about 8 or more every single night of the week. 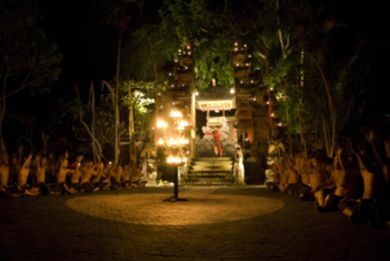 If you are in Bali during any of the Hindu cycles where gamelan and dancing is planned, the best way to see it is in an actual temple ceremony. Ask your accommodation or the Ubud Tourist Info office or your driver to find out if any are happening when you are in Bali. There are also plenty of spas for resynchronising your chakras, and all manner of spiritual classes and treatments, some distinctly less genuine than others. 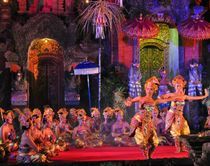 Dance performances are held almost nightly at Ubud Palace and Pura Taman Saraswati (Ubud Water Palace) which has an open-air stage surrounded by water with beautiful backdrop. 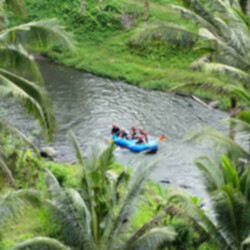 There is good rafting available on the Ayung River at Sayan, just west of Ubud. Almost as good as the rafting itself is the wonderful experience of being right down inside the Ayung gorge. This is the domain of high-end resorts like the Four Seasons and Amandari, and it is a very scenic area indeed. The rapids are Class II and Class III, and best during the rainy season as the river can run a bit dry from June to September. There are two well established operators, both with offices on the main road in Sayan, close to Amandari, however other operators have sprung up recently as well. Cycle tours are an increasingly widespread and popular option. Ubud has a vast assortment of art and jewelry shops. Head for the boutique type stores on Jl Monkey Forest and Jl Raya Ubud for higher quality goods (with appropriately higher prices), or down to the market for bulk-produced cheapies. If hiring a car for a day, it might be worth it to make a stop in Tegallalang, where they are geared more towards wholesale buyers. The Sukawati Market is crowded and sells trinkets in bulk as well, but quality is dubious. The road to Ubud from Sanur in the south passes through a series of small towns and villages which specialize in the production of particular arts and crafts. 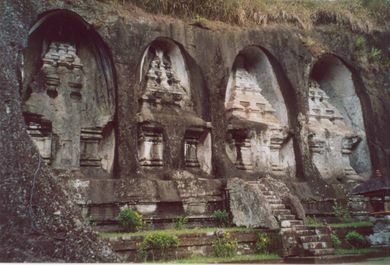 The towns are Batubulan/Singakerta for stone carvings, Celuk for silver jewellery, Batuan for paintings, and Mas for wood carvings. The whole area is sometimes referred to as the "craft villages" of Bali, although it is all a bit more built-up and congested than one might infer from the term "village." This is the best area to see and buy a wide variety of Balinese craftwork in a short period of time. There are many large showrooms where arts and crafts in the Balinese style are offered for sale. Nearly all organised day-tours of central Bali stop at one or more of these showrooms (and the tour operators usually have a financial tie-up with the places where they stop, collecting a commission on purchases.) Be careful, many of these shops specialise in pricing based on huge commissions to the drivers and tour buses. The road between Ubud and Kintamani is swarming with (supposedly)organic farms that have a wide variety of fruits growing on site as well as a few caged luwaks to make luwak coffee. The are probably about 20-25 of these in total and all of them are exactly the same. A guide will show you around and then order a selection of (supposedly) home made coffee and tea. You are then invited to buy these products in their ridiculously overpriced shops. Everything is 4-6 times as much as it would be in a local market. It's impossible to produce all that coffee and all those products on site as they claim. The biggest rip off of them all are the supposed hand rolled cigars (5 for 200'000). You can buy the exact same ones in town for about 35'000 (for 10). Most of their products (especially coffee) is just repackaged. Ubud is renowned in Bali for its wide range of restaurants, and is probably second only to Seminyak in terms of the quality of the offerings. Travelers on a budget will not be short of options, as there are many simple warungs serving up the standard Indonesian staples. 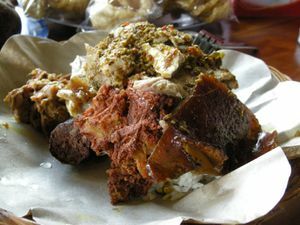 Babi Guling is a very popular dish for Balinese as well as tourists, and you can find it at most traditional markets and at roadside eateries as well. 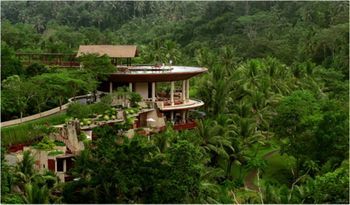 Many of the five star hotels in and around Ubud have top class restaurants, with the Four Seasons Resort and Maya Ubud being of special note. Beware of the local Luwak coffee, which has been linked to serious animal abuse as the demand for this coffee grows. Many spice gardens will keep the wild civet for displays - these animals are caught from the wild and kept in cages for the entertainment of tourists, usually under unacceptable conditions. Ubud has a vast selection of lodging for all budgets. Many visitors prefer to stay out in nearby rural areas instead of in the town centre, ideally with views of the famous rice terraces, but this can make it a little difficult to get around. 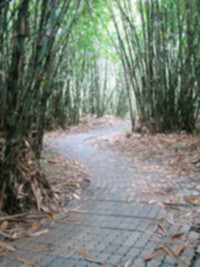 Jl Bisma and Jl Kejeng on the west side have numerous homestays but within walking distance of central Ubud. As in most of Bali, in all but the grandest of hotels, check-in and check-out times are a bit of a moveable feast. It's safe to assume about 14:00 and 11:00 respectively. Ubud has many homestays which are the cheapest form of lodging, a good way to meet the locals, and the natural replacement for hostels on the backpacker circuit. 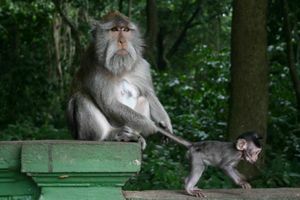 If you want to stay in town, the area around Jl Monkey Forest is generally the most expensive little more expensive (from Rp 80,000-100,000 per night). If you want cheaper prices try the areas around Jl Hanoman, north of Jl Raya Ubud and further out in Peliatan. In the low season especially, bargains can be had by those willing to bargain. Some of the most luxurious resorts anywhere in Asia are in Ubud, so expect superb standards, with prices to match. The following are private, villas which only take a single group of customers at a time. Ubud is a safe town unless you happen to fall into a gutter. Ubud gutters usually go under sidewalks and covered with concrete plates which are randomly destroyed, so it's quite easy to fall into gutter and get severely wounded. If you are unlucky with people, the police station is on Jl Raya Andong, just east of the town centre. Follow Jl Raya Ubud east to the end, turn north and the police station is on your right hand side. ☎+62 361 975316. Ubud does not have a fully fledged hospital and the nearest is about 20 km to the south in Denpasar. There are a number of reasonable clinics though which are used to treating typical traveller ailments. At least 3 laundry businesses are available on Jl. Arjuna. They are not self-serve; drop off your laundry in the morning to get it back by the afternoon, or drop it off in the afternoon to get it back the following morning. All charge 15,000 Rp. per kg of laundry. Most dedicated internet cafes provide computers with fairly low speed access at a low price, Rp 6,000 per hour being the current standard. There is only one truly high speed location, Highway on Ubud Main Road, but be prepared to pay a lot more than in other places. In cafes and restaurants free wifi for customers is increasingly widespread. If you have your own laptop and don't need high speeds that's probably the best way to go, but beware of the hours internet is available can be fewer than the hours a restaurant is open. KAFE for example has excellent and uncommonly fast internet in a great environment but internet is only available from opening until noon and from 3-6PM. There is a refreshingly old-fashioned main post office at the Jl Raya Ubud end of Jl Jembawan. If you are staying in Ubud for any length of time, you can use this as a poste-restante office. Make sure you have your passport with you when you want to collect any mail or parcels. The area code for Ubud is 0361. +62 361 XXXXXX for international callers. 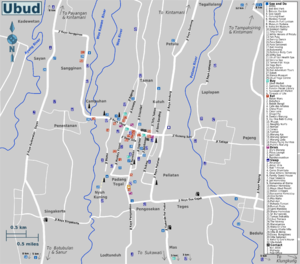 All of the major Indonesian mobile telephone networks have full coverage of the Ubud area. If you need to make an international landline call, there are many public phone shops (wartels) in the town. As with the rest of Bali, the few public telephones that exist are extremely unlikely to be in working order. In Ubud, it's easy to find alternate bus/minivan services to other destinations around Bali, you will not miss numerous travel agencies advertising these services (for example, on Jl Raya Ubud). Fares are similar or slightly higher than Perama (.g: Rp 50,000-60,000 to Kuta), the higher price may or may not be due to the nicer bus/minivan - enquire (and better check yourself if you have time) locally. If you are heading east, the road to Candidasa and beyond via Klungkung is often busy with trucks, but a nice one hour drive nonetheless. Bedugul has a traditional fruit market, a splendid botanical garden, and the Ulun Danu Bratan temple, about one hour north by car. The rice fields around Jatiluwih, about one hour north by car. The waterfalls around Munduk, about one and a half hour north by car. Lovina is an easy-going black-sand beach, about two hours north by car. This page was last edited on 19 March 2019, at 00:50.